The late Rennie Ellis (1940–2003) nailed Australia’s social back story like no other photographer. Sometimes subtle but more often shockingly in your face, his photos documented the surging social changes of the 1970s to ’90s, providing tantalising glimpses into a raw, uncensored slice of Australian life. Rennie’s catch phrase was ‘life’s a beach’, and he lived the outsider lifestyle he shot on film. In 1963 he left Australia to go travelling with little more than his favourite board and camera, and surfed the waves from the Atlantic to the Caribbean and Pacific. On his return to Australia, Rennie Ellis dabbled in advertising before refocusing on photography. Over the next few decades, he went on to open a photographic studio and agency, establish Australia’s first dedicated photography gallery, publish 17 books of photography and hold a number of exhibitions, both here and overseas. Ellis dived beneath the mainstream to preserve on film the idiosyncrasies and spirit of those who shared his offbeat world. 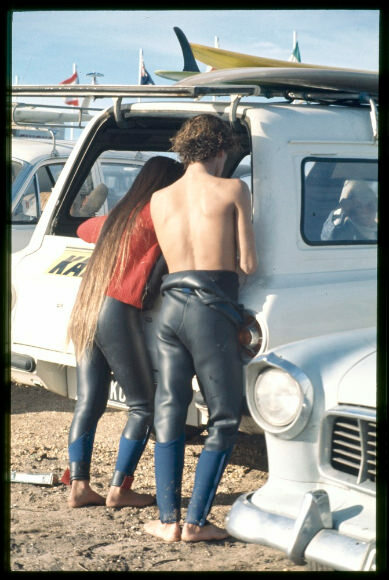 The personalities he photographed included the surfers, swimmers and sun worshippers who personified Australia’s freewheeling, outdoor culture, notably on Victoria’s wild southwest coast. One of the first locals to surf the legendary swells of Bells Beach was Owen ‘Yatey’ Yateman, in the late 1940s. Yatey was also one of the founding members of the Torquay Surf Club. By 1961, the word was out and the first Bells Beach Easter Classic surfing competition was held at Bells. Fast-forward to 1974 and the competition was renamed the Bells Beach Rip Curl Pro, named for local board-makers Rip Curl, established in Torquay in 1969, still independent and still going strong today. Rip Curl’s move to professionalise the Easter competition was controversial but hell didn’t freeze over and surfing has retained its spiritual purity. The annual event is the now world’s longest-running surfing comp. Each year over the Easter long weekend, Victoria’s Great Ocean Road is inundated with surfing’s elite as they head to Bells Beach to take on the iconic waves. Cars packed with enthusiasts and stacked with surfboards join ‘the pilgrimage’ as thousands of spectators flock to the coast to watch the world’s best male and female surfers compete. When the Bells Beach competition began, male surfers competed for prize money of $2500 – it’s now a hundred grand. Surfer and board shaper Simon Anderson introduced his tri-fin ‘thruster’ to the world of surfing in 1980. 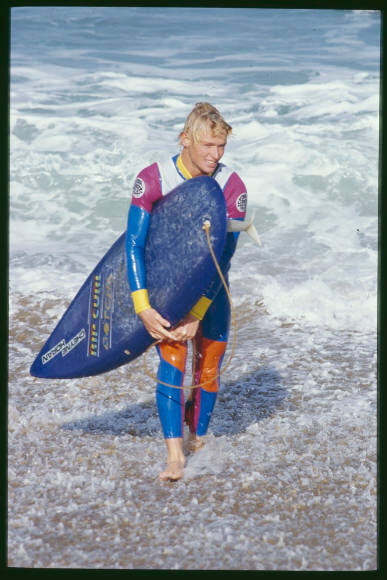 In 1981, he won the Bells Beach Rip Curl Pro using his tri-fin design in conditions that were perfect for this style of board. What is now an industry-wide standard in surfboard design was then an innovation. 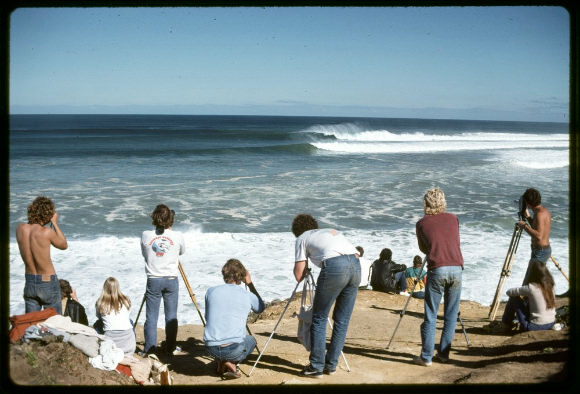 Anderson’s board wasn’t the only magical thing about the 1981 event – the swells were legendary that year, topping 15 feet. … my surfboard was the fastest on the planet at that stage and I was flying around these sections. 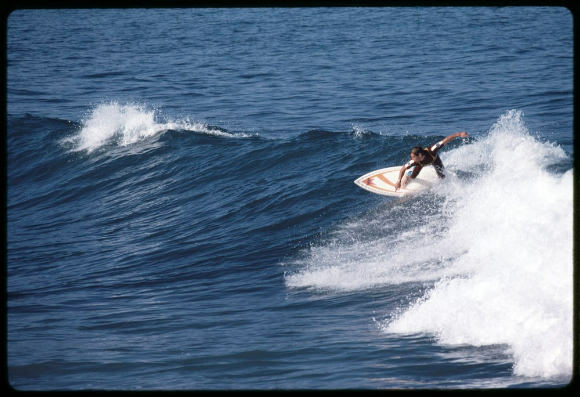 Cheyne Horan competed professionally in surfing for more than 30 years. 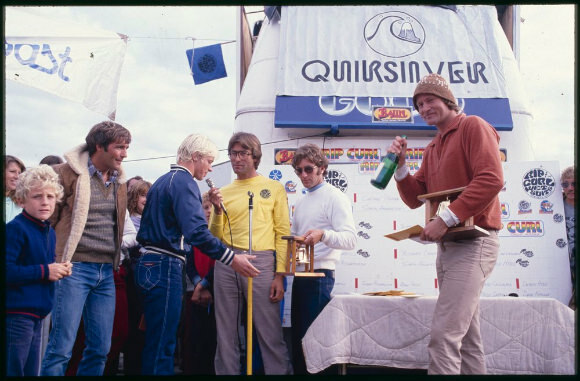 He is remembered for being beaten by Simon Anderson, competing on his ‘thruster’, in 1981, but reinstated his reputation by winning the 1984 Rip Curl Pro. That year he introduced the winged keel to fin design, which was inspired by yachtsman Ben Lexcen, who assisted him with this invention. Whereas male surfers won cash, women surfers were given a trophy and windbreaker. This sparked the formation of the Australian Women Surfriders Association, whose battle for parity continued well into the 1990s. Californian-born Kim Mearig competed a number of times in the Rip Curl Pro, taking out the championships in 1984 and 1988. She was an international threat to Manly local Pam Burridge, who was the Australian women’s champion from the age of 14. Filming the Easter surf pilgrimage was a natural for Rennie Ellis, combining his two true loves of surfing and photography. A dozen of Ellis’s surf photographs are featured in The changing face of Victoria exhibition, ranging from 1970 to the mid-’80s. Together, they capture an important time in Australian surfing history and include some of the personalities who’ve shaped today’s surfing industry. Explore the Pictures research guide to finding photographs, illustrations and other images in our collection. Janet is a freelance writer, editor and content producer.